I held off on the pumpkin baking until the first of October. I realize that I was kind of late to the party and now it seems like everything pumpkin has already been done (or over-done). Oh well. 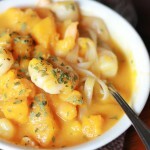 I still have a couple pumpkin recipes that I’m going to share anyway! 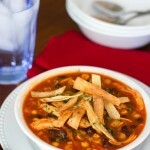 =) We had some cooler weather last week and I decided to make soup for dinner. What goes great with soup? Cornbread! And since I had some leftover pumpkin in the fridge after making pumpkin latte doughnuts, I decided to make pumpkin cornbread. Pumpkin recipes don’t always have to be sweet. 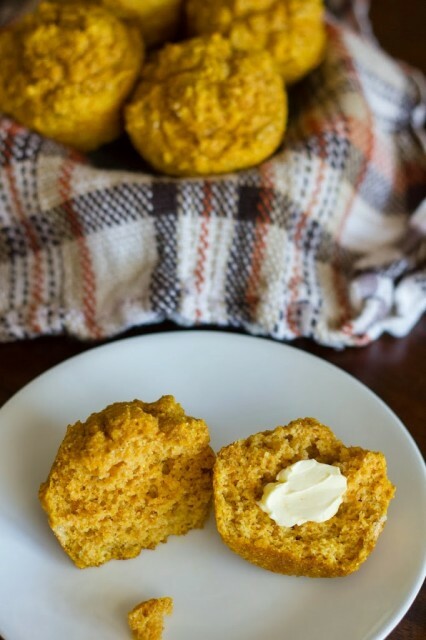 Jordan and I both loved the subtle flavor the pumpkin lends to this cornbread. 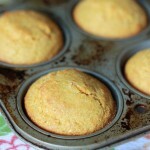 It keeps the cornbread nice and moist too! I made mine in a muffin tin but you could just as easily make it in a cast iron skillet. You should definitely give this recipe a try. Enjoy! 1. Preheat oven to 375 degrees. Spray 6 muffin cups with non-stick spray. 2. In bowl, whisk together flour, cornmeal, baking soda, baking powder, salt, and brown sugar. Add egg, pumpkin, milk and oil and stir to combine. Divide batter evenly among prepared muffin cups. 3. Bake for 15 minutes or until lightly browned. Makes 6 muffins.